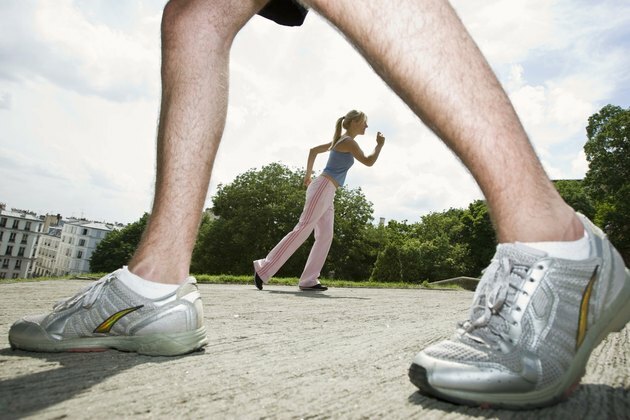 Interval running is an effective way to burn the maximum amount of calories. High-intensity interval training burns more total calories compared to long, lower intensity runs. High-intensity training imposes a tremendous amount of force on your body, and should only be done one or two days a week to reduce your risk of injury. Run-and-walk intervals can help you get to the 60 to 90 minutes of workout time recommended four to five days a week to lose weight and maintain weight loss. A treadmill will make it easier to watch the time and change the speed. Use a digital watch if you run intervals outside. Alternate your intervals. Interval runs are a very intense type of training. Do them every other day, and use a different type of interval for each workout. Always set your incline to 1 percent on the treadmill to imitate flat-surface running. On Mondays, do a long interval such as running for three minutes then walking for two minutes. This should last between 45 and 60 minutes. On Wednesdays, sprint for 30 seconds then walk for 90 seconds. Your sprint-interval sessions are very intense, so your walking should be a comfortable pace. Sprint intervals must be no more than 20 minutes. At the end of this type of session, you should feel like you went “all out” and are unable to run any farther. On Fridays, run for 45 seconds, then walk for 2 minutes and 15 seconds. Run your first 15 minutes at the 1-percent incline. For the remaining 15 minutes, use a 3-percent incline for the run intervals. Do this hill interval for 30 minutes. If you are outside, run up hills, then walk down. Know your workout. Write out your interval workout on a piece of 4-inch-by-6-inch sticky paper, and tape it to your treadmill. It should include the work/rest ratios, speed, and incline. Keep a pencil nearby to write down the total distance covered and calories burned once you are done. Note any changes you made to your workout. If you are outdoors, write down what you did as soon as you get home. Make small changes. Increase the speed by .1 miles per hour. Extend your long interval sessions by five minutes until you reach 90 minutes. Small changes ensure you make progress toward losing weight while reducing your risk of injury. This also improves your chances of maintaining your exercise program. You can set some treadmills to a decline, mimicking running downhill. Run three minutes on a 1-percent incline, then one minute at a minus-3-percent decline. Make sure you have supportive running shoes to reduce your risk of spraining an ankle, especially for interval-type training. Will 10 Minutes on the Treadmill Help Me?